Hello, and welcome to my section of the website. Most Club members will know me as a main Committee member of the Club and particularly as the Editor of our bi-monthly magazine. Coming from a background of manufacturing engineering, I’ve also been happy over the years to participate and help with the re-manufacture of spare parts for our rare vehicles and most recently I’ve been giving some temporary support to our spares operation, acting as our Spares Officer. 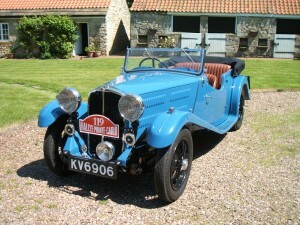 My association with the Club goes back to the late sixties when I bought my first Gloria; a 1933 four cylinder saloon. In those days seventy five pounds bought you a rough A35 or a Morris 1000 – or perhaps something a little more interesting and my Gloria sparked a lifelong interest (some say, obsession) with the Triumph make, and the Gloria model range. A full restoration in 1992 was completed and that exercise was followed by similar projects on the remains of a 1935 Gloria 12 Tourer, a 1933 Gloria Tourer that had interesting history having been one of Triumph’s own works cars that competed in the 1934 Monte Carlo Rally and the currently on-going restoration of a very late 1937 Gloria Southern Cross that was one of the three factory fitted with their all overhead valve engine developed in 1936 – and I’ve still got them all. My position as Regional Rep, however, is by no means the least of my Club duties and I welcome contact from members, old and new, who seek help, social interaction with the Club or just consolation when things don’t go according to plan!